Bernice Pauahi Bishop Museum, Honolulu, H.I., printed corner card on cover bearing 5¢ rose lake (76) tied by "Honolulu. H.I. 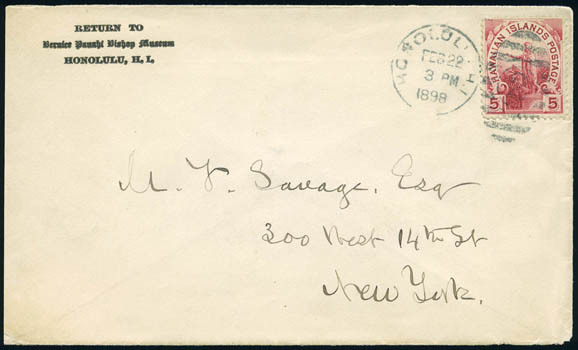 Feb 22, 1898" duplex to New York N.Y., reverse with Victoria B.C. (3.5) transit and New York (3.12) arrival cds, Very Fine. Peters-Uota No. BM-CC-2 Estimate $200 - 300. The Bernice Pauahi Bishop Museum was established by Charles R. Bishop in memory of his beloved wife.